THE SAD PASSING AWAY OF OUR DEAR CHAMPION GENARO " CHICANITO " HERNANDEZ HAS BEEN CONFIRMED TODAY , HE IS NOW IN THE ARMS OF GOD AND WILL BE REMEMBERED BY ALL AS ONE OF THE GREATEST PERSONS WHO EVER STEPPED INTO A BOXING RING. GENARO WAS A CHAMNPION IN THE RING , A CHAMPION IN SOCIETY , A CHAMPION TO HIS FAMNILY AND FRIENDS AND WILL BE A CHAMPION FOR ETERNITY AS HE HAS LEFT HIS MARK THROUGH HIS PASSING IN LIFE WHICH WILL ALWAYS BE AN INSPIRATION TO MANY. HIS CHARISMATIC SMILE , HIS SOFT SPOKEN STYLE , HIS BRAVERY IN THE RING AND SPORTSMANSHIP WERE ALWAYS AN EXAMPLE TO ALL AND HE WAS A NATURAL LEADER WHO ONLY CARED TO DO GOOD DEEDS IN THIS WORLD. GENARO WON THE WBC SUPERFEATHERWEIGHT CHAMPIONSHIP IN A DRAMATIC FASHION , WHILE HE HAS AHEAD ON THE SCORECARDS AN ACCIDENTAL AFTER THE BELL PUNCH LANDED ON HIS THROAT FROM THEN CHAMPION AZUMAH NELSON , HE COULD HAVE STAYED DOWN AND WOULD HAVE WON BY DISQUALIFICATION BUT INSTEAD HE CONTINUED FIGHTING AND WON A 12 ROUND DECISION OVER THE LEGENDARY PROFESSOR AZUMAH NELSON. 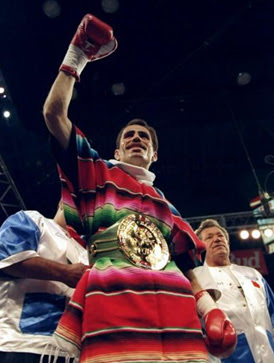 GENARO ONLY LOST 2 FIGHTS IN THE RING , HE LOST TO OSCAR DELAHOYA AND HIS LAST FIGHT , IN WHICH HE SURRENDERED HIS WBC CHAMPIONSHIP TO FLOYD MAYWEATHER. GENARO WAS THE FIRST BOXER TO EVER PARTICIPATE IN THE WBC CARES PROGRAM , HE VISITED THE LA CHILDRENS HOSPITAL AND HE WAS DEEPLY TOUCHED FROM THE SO MANY KIDS WHO WERE SUFFERING FROM CANCER. THE WBC WAS INFORMED BY THE HOSPITAL THAT GENARO , BY HIMSELF RETURNED THE FOLLOWING DAY TO GIVE MANY TOYS AND PRESENTS TO THE KIDS ON HIS OWN. GENARO WILL BE REMEMBERED , HE WILL BE MISSED , HE WILL INSPIRE AND DRIVE MANY OF US TO BE BETTER HUMAN BEINGS AND TO ALWAYS APPRECIATE LIFE WHILE WE HAVE IT.